Click on the regions on the map to zoom in and locate the mountains. The regions, with their names and numbering are taken from The Relative Hills of Britain by Alan Dawson. A Corbett is "a Scottish hill between 2500 and 2999 feet high with a drop of at least 500 feet (152.4m) on all sides". They are named after the list's original compiler, J.Rooke Corbett. The Corbetts are a subset of the Marilyns. 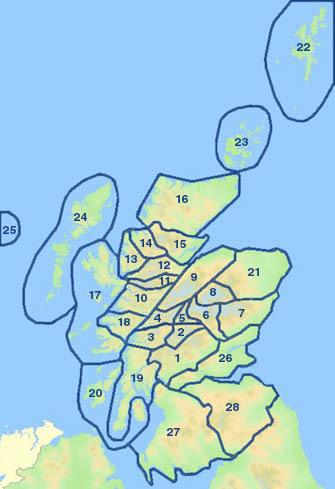 (Corbetts appear as Class=C on this website).